Eking power from urban wind to attempt to bolster my PV system mid-winter. I already have a solar PV pilot project underway to power my office lighting and take my main Internet server/laptop off-grid some of the time. One way to 'fill in' the trough in mid-winter solar PV might be wind power, which helpfully peaks (at least in the UK) when solar is at its lowest ebb. A mixture of (micro)generation mechanisms can make sense for supply security. This is fine and dandy for the Outer Hebrides, but urban London doesn't get consistent strong non-turbulent wind, as all those 'urbs', ie buildings, disrupt airflow unless you get permission to put a turbine on a 20m+ mast! The purpose of this pilot is to establish just how much residual wind power is readily available at one location in urban London, given that I don't need the typical 400W to 1kW that micro-generation seems to over, and indeed a mean 20W would cover the laptop's use entirely. "Readily" available implies no huge, dangerous, noisy nor planning-permission-requiring machinery. I don't want to annoy my neighbours, and my DIY skills are minimal, and at this stage I'm just trying to establish if wind is useful at all here, so I need to keep it all small and simple. The ever-helpful Ben Jandrell of GotWind.org helped me get my hands on a tiny (1W maximum at ~5V AC output!) HAWT (Horizontal Axis Wind Turbine); very cheap too at ~£10. In fact, I bought two to have one to cannibalise for spares and to tinker with while leaving intact whatever my main installation is. Given the tiny output of this turbine it is clearly not going to make much difference to my RE system, but as at least a point of principle I want to harvest some power from it (into my solar-PV lighting system), and I need to automatically monitor and log when power is being generated to decide whether to go for a 'grown-up' turbine later. Upon examination of the generator/motor that comes with the turbine I note that it has three (3) output wires, which I take to be 3-phase delta (if it were Y/Wye I'm guessing that I'd see a 4th/common wire). The output of the generator is of course AC. The electronics that come with the turbine (and fit into its body) use a 3-phase full-wave bridge rectifier to charge a 5.5V supercapacitor, and the turbine is specified to generate about 5V out at 1000rpm in a light wind (and up to 15V in relatively strong wind). I removed the supplied electronics and put in a voltage multiplier of my own (see below) to get far enough over 12V in a reasonable breeze to charge a 12V lead-acid battery. I have an opto-isolator (and LED) for visible and laptop-monitored indication of when wind power is being generated/harvested. Some simple stats on wind availability can be seen via the link at the bottom of the page. I put together a Cockroft-Walton (CW) multi-phase voltage multiplier with capacitor values to be lower than the winding impedance at 1000rpm (17Hz) assuming one voltage cycle per rotation of the generator spindle, and thus to be able to pass on all the available energy. Given a winding resistance of ~60 Ohms that implies capacitor values of at least ~220µF, but given that the output voltage seems to cycle much faster than the spindle (due to multiple poles?) then it would probably be possible to use smaller capacitors. I just picked up what I had to hand in my component box. Note that capacitors further up the multiplier are smaller for efficiency, and that I omitted the final/top capacitor since I only care about pulses of current into the battery for charging purposes, not a steady voltage. My working assumption is that I have about 5V RMS AC from the generator and need to generate pulses of at least ~15V DC open-circuit to push charge into a 12V lead-acid battery, allowing for it to have a open-circuit voltage of ~13V, and needing to traverse several diode voltage drops at least. So the circuit that I have built is nominally a voltage quadrupler (x4), but given losses such as from the diode forward drops, it is actually nearer x3. All the rectifier diodes are IN4001 or similar (1A max, 50V PIV) and in fact one set of four is provided by an old bridge rectifier that I had. All capacitors and diodes should be rated to at least 2x/3x the maximum generator AC peak voltage, which would be 3x5V, ie 15V+, in low wind. And in fact because I clamp the output voltage at ~15V later (and lower when charging the battery) then 16V or higher should suffice, but preferably closer to 50V for a peak turbine AC voltage of 15V. Again, I picked what I had to hand, and the capacitors are rated to 16V or 25V; I may have to replace some later! The diodes should be fine. I tried to build the multiplier circuit small enough to go in the turbine body but failed; so there is a 4m hop from the turbine to my shed and the multiplier, and then another several metres up to the battery end currently in my office. At the battery end there is a series of ~15V+ open-circuit pulses when the turbine is turning. These are clamped to a maximum of 15V by a power Zener diode to help avoid feeding damaging spikes into the power circuits, and to passively dump excess power that cannot be absorbed for whatever reason. The pulses are fed to the battery via a simple rectifier, which will clamp the pulse peak voltage to the battery voltage as the battery has very low impedance. If the turbine were larger there would need to be a dump controller to dump excess energy, to avoid damaging the (gel) battery by overcharging it. I have productive ways of dumping excess power in my system, for example by the laptop absorbing up to an extra 40W (over its normal 20W) to do extra research work. The Zener and battery clamping of voltage should help limit the strain on the components in the voltage multiplier. Note that in principle, several turbines and multipliers could feed into one battery-end unit. I may end up with a small wind farm of tiny turbines: a "wind lawn" perhaps? Along with the Zener, to help dampen spikes from the turbines and from the small transmission lines that I have (they are inductive, for example), is a small capacitor, allowing current spikes into the battery to be spread. Note that for larger turbines the power Zener can be replaced with a simple crowbar overvoltage 'emergency stop' for when the battery is overcharging (or becomes disconnected) which should protect the rest of the system and slow or stop the turbine(s). If the turbine is the primary charging source then a dump-load system is better. The capacitor also increases the chance that a small burst of wind will keep the external LED and opto-isolator lit long enough to be sampled by the digital input for the laptop to record. make better use of the current rather than dissipating energy in the series resistor to no effect! At construction, the opto-isolator output is being sampled every 2 (two) minutes via the USB digital inputs to the laptop. The first full day of monitoring indicated less than 10 minutes' worth of wind power! I have an 8-turbine MotorWind ordered, and from my current observations I guess that I will have ~3--5m/s wind-speed much of the time when the wind blows at all, with gusts up to and above 10m/s. I am assuming that ~5--10m/s is approximately the cut-in speed for normal charging of a 12V battery via a 3-phase bridge rectifier, and that at at a range of useful wind speeds below normal cut-in for 12V charging I may have useful power available. An 8-turbine MotorWind might generate about 6W at 5m/s and 50W at 10m/s, and even 1W at a little below 3m/s would be useful for a trickle charge. In order to maximise the collection at low wind speeds, ie below normal cut-in, I may try piggy-backing a simple voltage doubler onto the bridge rectifier as shown in the circuit above. The 10 Ohm resistor is to limit ripple current for the capacitors and their associated diodes which may be rated lower than the bridge's diodes; its value should be adjusted depending on the generator DC impedance and the capacitor values and maximum ripple current, and it might not even be needed. Its effect should be negligible at the low wind speeds when this doubler circuit be useful. The capacitor values should be adjusted to match the winding impedance at the (mid) AC frequency at low wind speeds below normal cut-in, to maximise transferred power. Minimise component size and cost. The Savonius Envirotek V20 including controller and UK delivery of a shade under £300 rated at 6Ah/day into a 12V battery at 4.5m/s and 16Ah/day at 9m/s. The Giromill/Darrieus Flex-400 from Fleximedica, ~400W at 13m/s for £800 including charge controller and UK delivery. See my big Benesh box attempt. With solar PV, handling excess/unwanted available energy is often simple: just disconnect from the PV and it will sit at a slightly higher-than-nominal Voc (Open-Circuit Voltage) and do no harm at all. For wind turbines without some sort of mechanical speed control such as variable-blade pitch control or a mechanical brake, it may not be wise of safe to simply disconnect the electrical load when the power is not needed, eg when the storage battery is full. If there is a strong wind and you 'disconnect' then the mill may speed up and mechanically disintegrate from the strong rotational and gyroscopic forces. Even if the turbine does not fall apart dangerously, the peak output voltage is usually roughly proportional to mill speed and thus windspeed, and so Voc for a speeding wind turbine may damage any downstream electronics too. 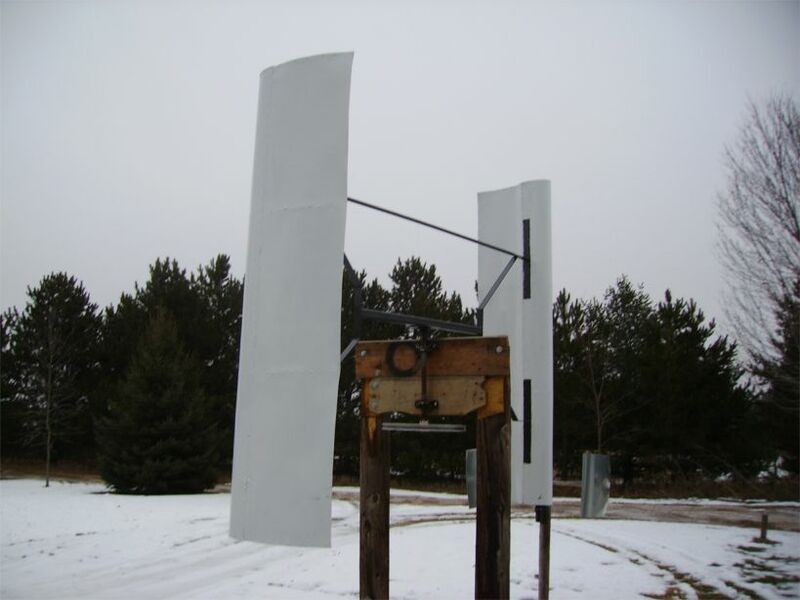 Turbines can be made passively able to better cope with high wind speeds and light electrical loads with, for example, "furling" to point them out of high winds, or using designs such as VAWTs that tend to speed up less due to turbulence. However, some mechanism such as a controlled "dump load" to draw enough power from the turbine to keep its speed in check without mechanically or thermally hurting it, is usually a good bet. I'm currently wondering if a 'crowbar' style overvoltage protection, of a similar flavour to that in some computer power supplies, would be fast enough to help deal with overvoltage, ie, once overvoltage is detected it triggers a fast SCR or triac to short the output until the voltage drops to zero, eg when the mill eventually stops. That would be an electronic brake for the mill too, though a bit savage. It could be fast enough to protect the electronics, and the power dissipation in the SCR or triac would be low. With the triac before any bridge rectifier then (a) you'd avoid loading the rectifier and (b) the triac would release on each zero crossing, so you'd only short the given coil for part of the time, which might be much gentler all round on the mill, electronics, triac, wiring, etc. I have some thoughts on overvoltage protection circuits to protect wind turbine controllers. I am building and testing a circuit at the moment so have been thinking about this. What I have at the moment is a pair of 3 phase rectifiers. One goes to the battery, and the other goes to the dump load. The controller will go between the battery and one of the rectifiers. I did think of a crowbar circuit, but felt that this would not work very well. So I am thinking what is needed is a circuit that switches the load to the dump intermittantly to keep the blades out of stall, but not stop them completely. After a lot of head scratching I have come up with a possable solution. A IGBT in series with the dump load, controlled by a SIDAC. It is a variation on a new design of solid state tesla coil spark gap. Look up "sisg" and read Terry Fritz's paper for the basic details. Don't know if it would work, or indeed be any better than a FET and a Zener diode. All the FETs I have tried have ended up fried from overvoltage spikes. Not sure how fast it needs to operate to protect the FETs in the controller, maybe a low pass filter on the rails may help? That's the rough idea anyway. I am still waiting for some decent wind to see what sort of voltage to expect from the alternator. Thinking around 100 volts. To which I said that I'd still be inclined to use an SCR as they are expressly designed to be used in things like crowbar circuits and are optimised for minimal voltage drop and resistance I imagine, and you can't easily accidentally leave an SCR 'partly on' like might happen with a FET, causing it to overheat. As regards SCRs v FETs I think in this application you might be right. I still have a lot of reading to do on crowbar circuits. The problem seems to be shaving off the extra voltage without totally killing all the speed. Ideally the controller should control the speed, not the crowbar circuit. I can see problems with the crowbar circuit and the controller interacting with each other and the whole thing hunting. Of course the easy thing to do would be to just overate all the power components on the controller power board so that it is bulletproof. I might do that after I get it working with FETs, then change over to IGBTs later if it all goes up in smoke. I better get it working before I try and "improve" it. My guess is that the crowbar will avoid hunting if it is after the bridge rectifier because it won't 'let go' until the mill basically stops if I am right, because the release voltage on an SCR is only a volt or so. If before the bridge then I agree, the extra potential finesse that you have also allows for hunting as you suggest if things aren't tuned quite right. Maybe a two stage version would work better: a lower-voltage cut-in with a dump-load of lower resistance than usual to slow/stop the mill quickly but gently, and to protect the mill from overheating (so significantly higher than the mill coil resistance I guess). The second stage with a higher trigger voltage would be a straight all-out short when the gentler circuit had failed to slow the mill enough, ie an automatic emergency stop. Two SCRs and trip circuits are a few pounds/dollars I think. I was thinking more on the lines of this being like an emergency dump/shunt load when you'd got all the power you need so you're protecting the system from overspeeding rather than trying to regulate anything smoothly. It would just be nice to avoid ripping off the blades by trying to stop the thing totally dead instantly. Update 2007/09/16: I've ordered an 8-turbine MotorWind for evaluation, probably to mount on about 3m of clear garden wall. This should reach me in time for 'prime wind' in November I hope! Recorded ~1h of usable wind power today. Update 2007/09/20: I've put up my second tiny turbine, though only with its original blades/vanes and electronics, so it may contribute to detecting available wind power but will almost certainly not contribute significantly to battery charging. This turbine is mounted very close to the house (~1m) with the aim of capturing some 'canyon effect' passing winds, but seems to catch relatively little, even at about 3m above gound level and 1m above any other obstruction. It also unexpectedly skews itself at about 30° from parallel to the wall. I have ordered the parts to build the voltage multiplier, using essentially the same components as before though with bridge rectifiers, since I might as well try to capture something from it. Use 470µF capacitors throughout since the ones I have are physically much smaller than the 1000µF caps. Also, this might allow a little more energy to be extracted in low wind reducing swamping (impedance mismatch) of the turbine output with the larger caps. Yes, the 'upper' caps should be smaller still: next time! Consider a bypass diode from each side of the turbine direct to the +ve output to provide an efficient DC path on each half cycle when/if the turbine really spins fast. Update 2007/09/23: Chickened out of putting the multiplier in the turbine body! Used newer tweaked (as above) design for the turbine further from the house to make more use of the better wind that it gets, I hope. Connected the other (newer, close to the house) turbine to the old multiplier. Some evidence that both systems are working OK (just a few gusts today). In theory I can now max out at ~4W! Did not cut/install extra blades for the newer turbine yet. This shows me that although some wind power is available when the sun is down, which is good as it reduces absolute dependency on batteries in the dark, most is available when solar PV is also available. See the historical stats too, though the data that went into the above snapshot was deleted by accident. Update 2007/10/04: I've ordered a PM generator from FuturEnergy for experimentation. I've ordered the 48V-nominal model to maximise voltage output at low RPM. This generator is 3-phase delta-wired. I'm probably never going to get anything like its maximum rated power, but it should be sturdy enough to test blade designs on, and stands a chance of working well enough at low RPM for a S-VAWT for example. Update 2007/10/08: The PM generator has arrived: it's HUGE! Mounting and using will be a real challenge to my limited DIY skills; in particular the wires come out of what I see as the spindle. Theoretically to use this at full power I'd need a swept area of at least 4m^2 in 20mph (10m/s) wind, and likely much more than that because of various inefficiencies. Mind you, that would be enough to power my entire house with some to spare! Update 2007/10/11: I'm thinking of building a modified Benesh-style blade rather than plain Savonius, and Sandia had a similar design optimised some time ago. The blades are much flatter than half-circles, to give some lift AFAIK. 12-Oct-2007 Hong Kong Item posted and is being processed. 12-Oct-2007 Hong Kong In transit. 13-Oct-2007 Hong Kong Processed for departure. Update 2007/11/21: I've been computing the stats for the longest gap for laptop off-grid and wind power for most of October and November. Wind is showing a gap of well over a week and ~1% availability, which suggests that it really isn't an RE contender in my part of London. Update 2008/07/08: The MotorWind has been working well, so far as I can tell, and no one seems to be bothered about the noise that was worrying me. I'm in a rotten area for wind (in a dip, in the suburbs, amongst trees) but I seem to be getting some output very roughly 10% of the time, in particular more when the weather (and solar PV output) is poor, and there is at least some energy gathered at night. (Look at the relevant months in the historical data.) I'm not sure whether to go for more wind or more solar this winter. MotorWind has some interesting new designs if it's wind that I decide on. Basic guide to wind energy c/o the Danish Wind Energy Association. 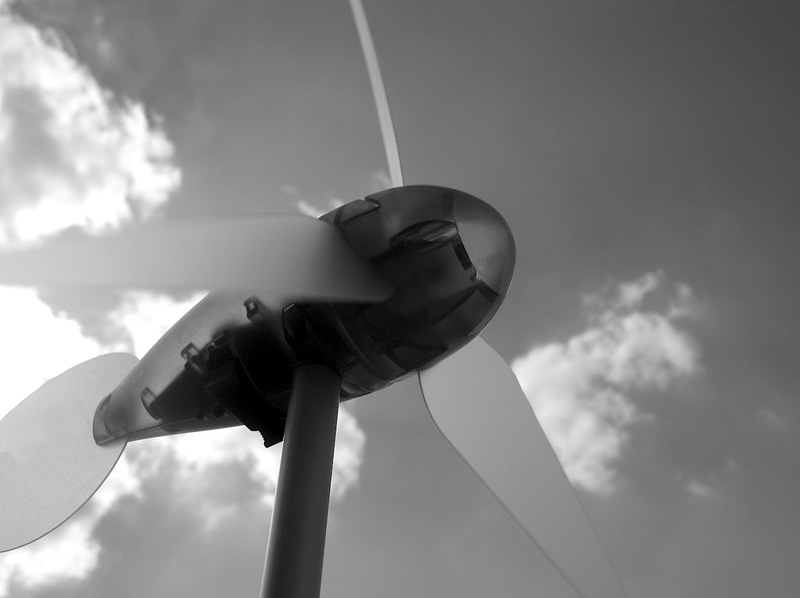 An interesting forum: Wind Energy Planning. The GotWind.org site run by the ever-helpful Ben Jandrell. Basic Cockroft-Walton (CW) and Villard cascade (etc) and AC-driven half-wave series voltage multiplier that might be suitable for charging 12V battery from lower-voltage AC windmill output. The three-phase multiplier shown might be especially suitable for a small (toy!) turbine I'm looking at. See another explanation/description of my tiny voltage multiplier design at REUK. The Bottom Line About Wind Turbines from the people who know at OtherPower.com! The Humdinger Windbelt based on a vibrating taut membrane, due in kit form in early 2008. Interesting urban-friendly low-power small 'MotorWind' design apparently actually shipping. Very basic conversion for wind speed: 1 m/s (metres per second) = 1.95 knots = 2.24 mph (miles per hour) = 3.28 fps (feet per seccond). A home-built VAWT and several more home-baked designs, and more robust, and some more, and a good general discussion with the major point that "lift" designs are more efficient than "drag", but more complex, and this OtherPower thread. A HAWT/VAWT power contest (pretty even) with interesting Lissajous blade shape. A simple S-VAWT may operate best when loaded to rotate very roughly rpm = mph / ft diameter. First published 2007-09-11 , updated 2019-04-22 , rebuilt 2019-04-23 . Site copyright © 2007-2019 Damon Hart-Davis. Hosted by ExNet.